It is a coffee shop, a tea room, but it is also a cupcake store, which organizes birthday parties for cute little fairies; and it holds workshops for moms and non-moms alike who want to learn how to make the perfect frosted cake. You can also order the perfect unicorn or panda birthday cake. Cherry on top — it even sells cute jewelry, stationery, tote bags (my absolute favorites, the Spanish brand “Wouf”, known for their crazy design) and all kind of cute party accessories. Cuppin’s will awaken your inner child, it will make you believe in fairy tales again. Cuppin’s is just plain adorable. This store is a breath of fresh air. I highly recommend it if you need a “feel good” moment with your friend, your mom or alone. It is a great place for a “girls’ only” time. 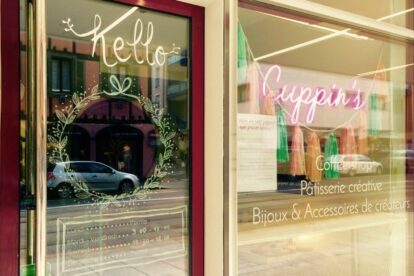 They also have another store in Lausanne.